The Ritz-Carlton in Laguna Niguel is by far one of the most popular and beautiful location to tie the knot in Southern California. There are many attributes the makes this location so popular for photographs, but the landing at the bottom of the famous staircase is definitely one of them. For this image, I wanted to create something unique that has never been done for my Persian bride. I have seen countless photos taken at this exact spot, but I was determined to find a unique angle. 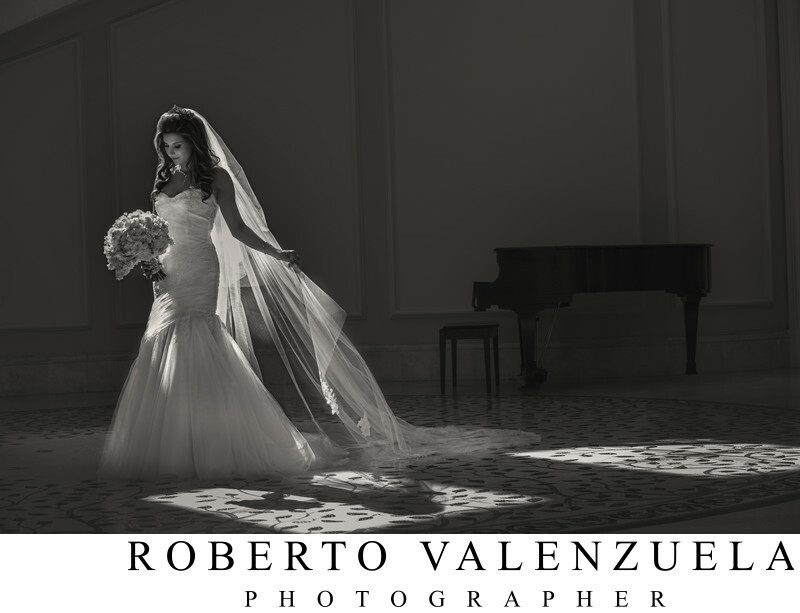 I used the light coming from the windows above to guide where to pose the bride. I positioned her in a way that the light coming from above, would gently caress her long wedding veil. Furthermore, the bride's shadow is clearly accentuated in the light box on the ground. With all the stress during the wedding day, I find this image to be completed serene and calming. I really enjoy the romantic and elegant nature of this black and white photograph. As for as composition goes, I asked my assistant to carefully move the grand piano on the right hand side a few feet to place it in the perfect spot. In this photograph, the bride is now on the left side and she is balanced by the piano on the right side. This photograph became one of the bride's favorite wedding images. At the time this photo was posted in Instagram, it received the biggest number of likes in my Instagram account @roberto_photo. I felt very proud of this wedding photo because it required taking that additional step to achieve something special for my clients. I proudly display this photo in my studio. I'm proud to say that this photo, also won an International silver award at the prestigious WPPI Annual Print Competition in 2015. Location: One Ritz-Carlton Drive Dana Point, California 92629 United States 1 (949) 240-2000.